Adding a pop of color to a black and white image is a great way to draw the eye. It works well in posters, book covers, or artistic photographs. All you need for this project is one of the select tools in GIMP, and “Colorize” to create a contemporary design. 1. 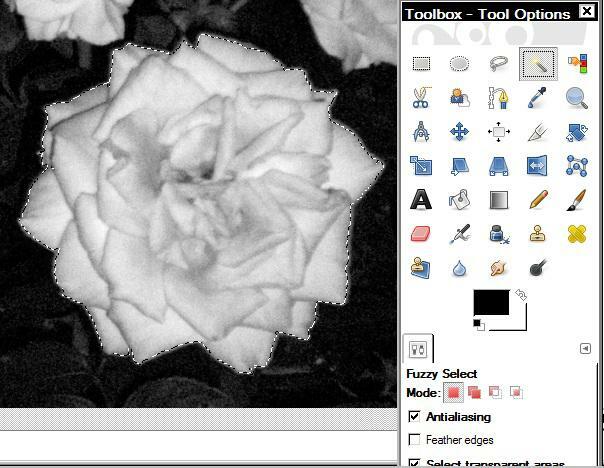 Load your black and white image into the GIMP editor. 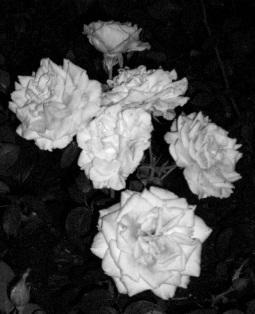 This project uses a black and white photograph of roses. 2. Click on the Fuzzy Select Tool in the Tool Box. 3. Outline an object in your image by clicking on it with the Fuzzy Select Tool. The tool will select areas based on color. If the entirety of the object is not selected, hold down the shift button and click on areas that you want added to the selection until the entire object is outlined. In this case, a single rose is selected. 4. Click on “Colorize” in the Colors tab. A new window will open up. In this window set the preferences for your colored object by Hue, Saturation, and Lightness. Play around with the sliders until you find a color and saturation that you like. This rose outline is colorized with a Hue of 285, Saturation of 60, and a Lightness of 35. 5. 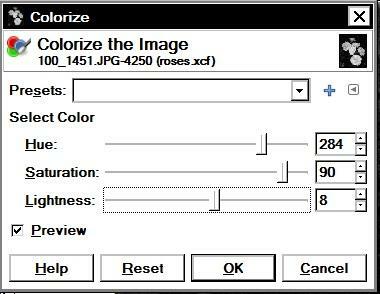 Press “OK” to saturate the selected section with color. 6. To remove the selection outline from the object, click the “Select” tab, and then click on “None”. 7. Don’t forget to save your GIMP file.